It’s been nearly 40 years since what the American media called “The Fall of Saigon” and the Vietnamese referred to as the Liberation. I saw it then as the Fall of Washington. The ghosts of Vietnam are back, thanks to two filmmakers with very different takes. The first is Rory Kennedy, Bobby Kennedy’s youngest daughter. Her one-sided account has already been nominated for an Oscar. The second is Tiana, an American of South Vietnamese origin, who made the film, From Hollywood To Hanoi, years ago to promote reconciliation between our two countries. Tiana is finishing a movie called The General and Me, on her unlikely conversations (for someone from a virulently anti-communist family) with North Vietnam’s legendary and late General, Vo Nguyen Giap, a.k.a the “Red Napoleon,“ a.k.a the man whose military doctrines defeated the French Army, and later, the Pentagon’s brutal Vietnamization strategy. Giap created the Vietnamese resistance Army at Ho Chi Minh’s request in l944, and without training, became a military genius. Tiana has two other self-promoted US “geniuses” in her movie too: pathetic walk-ons by former US General William Westmoreland, and an arrogant ex-Defense Secretary, Robert MacNamara, who could not conceal his contempt for her. Rory’s highly-hyped and well-funded movie depicts footage we have seen before of the hurried evacuation of US soldiers and some of their Vietnamese conscripts in a long and bloody war that was lost almost from its earliest days. Rather than look at the reasons for that loss, Rory has, with support from HBO and PBS’s American Experience series, tried to present a heroic picture of Americans in their last days in Saigon, coping with a Mad Ambassador and in some cases rebelling against US policy. These two films, all these years later, mirror the cultural and political divides of the times with one film, in effect, rationalizing the war, and portraying the American military as compassionate, and the other, for one of the first times, offering views from the other side that Americans never heard. Gerald Perry writes in Arts Fuse: “The mushy reviews of Last Days in Vietnam (a 94% Rotten Tomatoes approval rating) are extraordinarily similar. They praise filmmaker Rory Kennedy for documenting a forgotten moment of American history, the chaotic days in 1975 when the US raced to leave Saigon and South Vietnam steps ahead of the advancing North Vietnamese Army. And the critics are pumped up with pride at the stories Kennedy has uncovered of brave and noble American soldiers and a few anti-establishment American diplomats who helped evacuate many South Vietnamese–by boat, plane, and helicopter–who presumably would be enslaved or murdered by the Communist North Vietnamese. This did not surprise me. In 1976, the anniversary of the American Revolution, I published a small book featuring the views of Vietnam’s top military strategists including General Vo Nguyen Giap called “How We Won The War.” It was based on articles I wrote in the aftermath of the defeat of the US–backed Saigon military in 1975. Predictably, it got no pickup. There were many post-mortems about what we did wrong but, few if any, about what they did right. Surely, that story is historically more significant than how we cut tail and ran. The protest was all for naught. Public Television retreated into its archive of knee-jerk form letters and responded to criticisms of one program with a defense that cited all the programs they ran, most decades old, while announcing that a new multi-million dollar series on Vietnam by their always well-funded doc superstar, Ken Burns, is in the works. Typical! Rory focused on the story of efforts to save allied officers and their families in a Saigon (“Arvin”) Army known for its corruption and brutality. 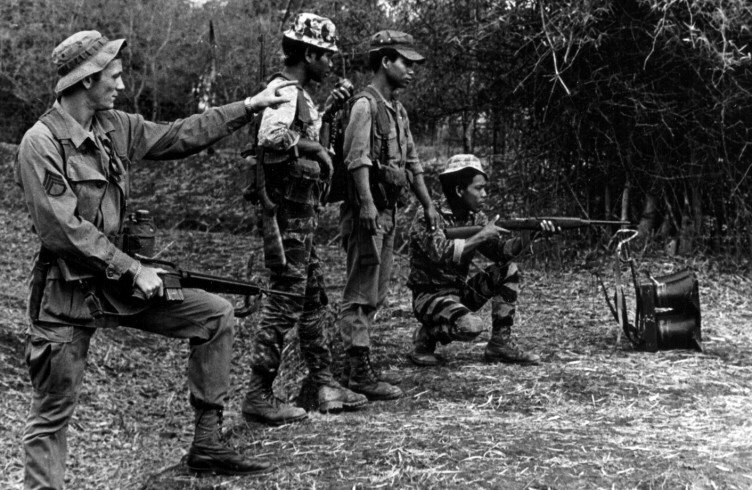 It citied atrocities allegedly committed by the Communists like the “Hue Massacre,” an event thoroughly investigated and exposed as false by US Vietnam Scholar Gareth Porter. It cited violations of the Paris Peace agreement by the North without mentioning the many more egregious and concealed violations by the US-backed South Vietnamese forces. It implied that all the people of Saigon would be butchered or imprisoned; that was not the case. It referenced escaping ships racing to ConSon Island without mentioning that that Island off the coast of Saigon hosted, like Guantanamo does today, brutal prison camps filled with “tiger cages” where Vietnamese opponents of the military regime were kept, killed and tortured. It’s been 40 years. What have we learned? The Obama Administration, aided by our Secretary of State, a Vietnamese speaker no less, named John Kerry, once the leader of Vietnam Veterans Against the War, had turned into an apologist for the American role in the war, and an arms salesman to Vietnam which fears the Chinese today more than the Americans. Whose voice should we listen to? Rory Kennedy with her slick and costly archive-footage based mockumentary of history, or Tiana who is struggling to bring Vietnamese voices and a deliberately buried history to life?